The men are playing the British Open this week. That doesn’t mean the women golfers have a week off. The world of Womenâ€™s professional golf plays its only match play event of the year this week when the HSBC Womenâ€™s World Match Play Championship in New Rochelle, New York is played at the brilliant Wykagyl Country Club. The Wykagyl Country Club was built around 1900 and is one of those courses that link us with the past, Lawrence Van Etten being the original designer, but Donald Ross, A.W. Tillinghast and more recently Arthur Hills and Crenshaw and Coore all having a role in its development over the years. It is highlighted by rolling fairways, tight fairways and small greens so typical of traditional north-eastern courses from a bygone era. The course has played host to the Sybase Classic since 1990 but that event moved to New Jersey in 2007 while the Crenshaw and Coore restorations were being completed but this fine golf course gets the ongoing exposure it deserves. The field brings together 64 of the worldâ€™s leading players competing for a first prize of US$500,000. The defending champion is Brittany Lincicome who beat Juli Inkster in the final at the Hamilton Farm Golf Club in Gladstone New Jersey to win her first USLPGA Tour event. Colombian Marissa Baena won in 2005 when she defeated Meena Lee by a narrow 1 up margin. The nature of matchplay has already shown the capacity of the format to produce upsets and there is every reason to believe there might be another this year. There certainly will be upsets. I’m going to make my predictions based on my picks for this week’s Pakpicker. (Note play is already underway. 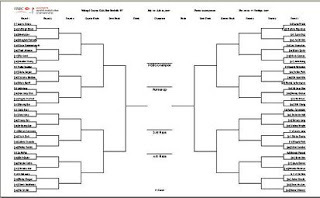 I had things to do this morning, that delayed my making this post) The Matchplay Brackets are above, but you can also click here to see them. Kerr over Hung- No that’s not a bad joke. Ochoa over Francella- This match could have the potential for an upset. Francella is a New Yorker and has played well this year, including a playoff win over Annika Sorenstam in Mexico. Ochoa over Hurst- Pat could surprise but she isn’t having quite as good a year as she had in 2006. Shin over Davies- The pudge match as I call it. The Stocky Shin vs The Rugby like Davies. Shin over JY Lee. Jee Young is the most underrated of the Korean players on the LPGA. She could win this whole thing. We’ll see if I’m right about my HSBC picks over the next few days.